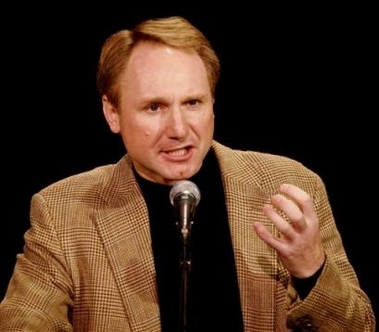 PORTSMOUTH, N.H. - Though he's been hit with lawsuits and rebuffed by the Vatican, author Dan Brown said Sunday it's not his responsibility to address controversies stirred up by his book, "The Da Vinci Code." He said he's happy his best-selling novel about hidden religious history, secret societies and code-breaking has captured popular interest, but leaves the deliberations to others. "Let the biblical scholars and historians battle it out," Brown told about 850 people at a sold-out writers talk. "It's a book about big ideas, you can love them or you can hate them," he said. "But we're all talking about them, and that's really the point." The talk was a rare chance to catch a personal glimpse of the private author. Among his revelations: When struggling with a difficult plot point, he dangles from a pair of gravity boots to think it out ¡ª a habit adopted while figuring out anagrams for his book "Angels and Demons." The audience also learned that the former prep school English teacher wants to return to the classroom, and that he rarely reads his work when it's done. "The Da Vinci Code" was an exception. "When the galleys came back, I sat down and I read the novel start to finish in one sitting, and I was really happy, really proud of it," Brown said. The book sold more than 40 million hardcover copies in three years in print. The paperback edition sold half a million copies during its first week, prompting publisher Anchor Books to bump its initial printing from 5 million to 6 million. Controversy is familiar territory for Brown, who even received harsh words from the Vatican for a plot line that suggests Jesus and Mary Magdalene married and had a child whose bloodline survives to this day. This month, a British court rejected a copyright infringement case brought against his publisher that claimed that "The Da Vinci Code" stole from an earlier, nonfiction work, "Holy Blood, Holy Grail." For Brown, the issue has become fodder for jokes. "By the way if anybody in the audience would like to sue me, we have forms out back," Brown said. "Just pick one up on your way out." The talk, presented by New Hampshire Public Radio and The Music Hall of Portsmouth, was billed as his only public appearance before next month's release of the movie version of "The Da Vinci Code," starring Tom Hanks. Brown an executive producer. Fans may have to wait a while for the sequel to "The Da Vinci Code," which again features Harvard symbologist Robert Langdon as protagonist. "I'm in no hurry," Brown said. "I just have to write a great follow up and it'll be done when it's done."